Older Brother moved out of his room, so Youngest Daughter finally gets a room of her own! She is beyond excited. Blue is her favorite color, so she decided on turquoise as her wall color. She wants to accent with shades of pink and pops of black-and-white. We went to Lowes and got a couple of samples of paint. She loved the darker shade, but we decided that it might be a little much for the entire room. 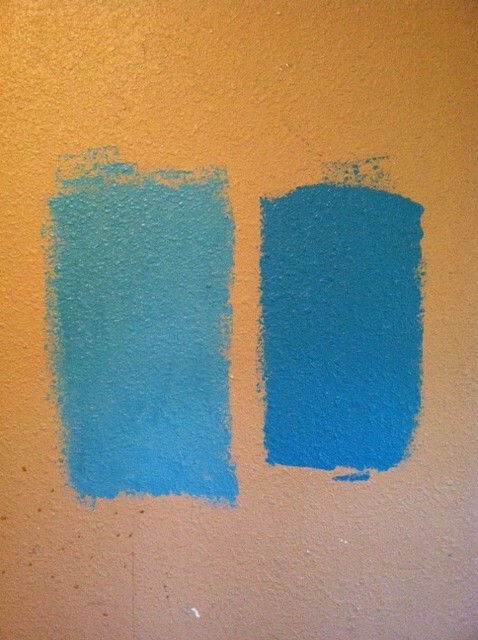 So we decided on the lighter shade on three walls, and then on one wall we're going to do wide stripes in both colors. I'm excited about this! I think it's going to be a really, really fun room. I'm so looking forward to working on this new project. I'll share the step-by-step process with you as we go along.